Looking for the best stand up paddle board ? You’ve come to the right place. Searching for the best stand up paddle board is a daunting task. Whether you’re a Standup paddleboarding beginner or expert, there are always dozens of stand up paddle boards available. Here at supboardworld.com, we’ve spent many hours curating the top rated stand up paddle board for every purpose, and compiled them into one list for you. We’ve put together this resource – a one-stop-shop, all-inclusive guide to help you find the best stand up paddle board that fits you and your skill level.And because stand up paddle boarding is a significant commitment of time, energy and money, a few, well-chosen questions will help you in the decision-making process. Where will you be doing most of your stand up paddling ? Maneuverability or stability? Which one would you prefer a very stable or a highly maneuverable board ? Do you want to use it for long distance paddling or are you more interested in stand up surfing ? The interactive chart of nearly 30 SUP boards below and the analysis that follows will help you decide what the best stand up paddle board is for you. How do I find the best SUP for me ? Learning to Stand up paddle board involves patience and balance, you don’t need to be really strong or fit , you just need to choose the right conditions and the best stand up paddle board for you ! That being said, when you’re shopping for a stand up paddle board, there are a number of factors you should consider. We are going to pump the brakes for a few moments! We want to give you some information that may help you in the decision making process when you are selecting a stand up paddle board. When deciding what paddle board you want to buy, there might be one particular choice you might not even know you have to make – inflatable or rigid? Despite what may look to you as a purely design choice, there’s actually a lot of thought that should go into whether or not you want to invest in an inflatable or a solid SUP. In short, Paddle boards come in two varieties : those that are inflatable and those that are not inflatable (often called hard, rigid or solid SUPs).You will find that each of them has its own pros and cons. And even what constitute pros and cons are different for different people – So , it’s up to you to choose the board that best meets your requirements. We’re not going to get into the debate about which is better; they both clearly work, and it really boils down to personal preference. 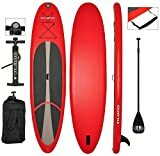 Rigid boards require storage space,a vehicle with a roof rack or pick-up for safe transportation and a level of care numerous newbies are not willing to make.Inflatable stand up paddle boards on the other hand might be an excellent choice for inexperienced novice paddle boarders. Length is another very important factor you need to take into account before buying your stand up paddle board. The length of the SUP Board ranges from 9-12 foot, with 10-foot being the most common size. The general rule of thumb is that the longer SUP board are geared towards catching waves early and enable the rider to cruise and perform classic longboard evasive maneuvers techniques and tricks such as ‘walking the nose’ and noseriding. These boards will usually have a full and rounded nose to them and either have single, 3 or multiple fin configurations.That being said, people who want to hit the waves should definitely opt for long stand up board. 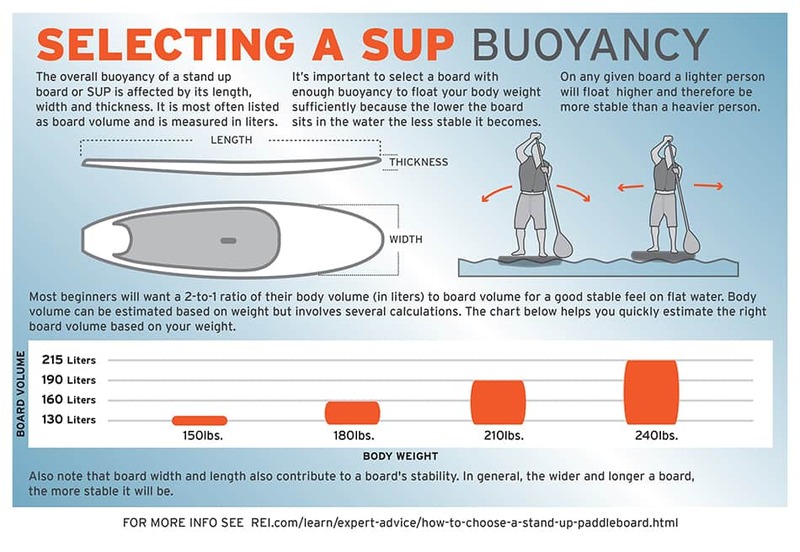 Another important thing about longerboard is that they can support heavy weight, making them the best choice for heavier people.All SUP boards have a weight limit, so hone in on that to determine if it can hold you or not. Otherwise,if you’re just planning on using it for flatwater paddling,like in a lake or river,then a short stand up paddle board will be you best bet.Shorter SUP boards are designed to be very stable in a flat water environment and have plenty of volume (buoyancy) which makes them easier and more comfortable to stand on. How Will You Use Your SUP ? Now that you know the different types of SUP boards,you need to determine what you plan on doing with your board before making your final decision about which board to go with.This is important because not all boards are made the same.Some boards are well-optimized for different things.Some are versatile and can perform in a wide-range of water conditions,while others are made to perform in one single thing. We want you to get the most bang for your buck and we feel that knowing how you will use your SUP board can often help in deciding which one to buy. All-Around FLAT WATER SUP : All-around boards are designed to perform well in all conditions.These versatile, multi-purpose boards offer a lot of stability, which makes them a great purchase for beginners.All-around boards are wide enough to be very stable.They have decent glide and tracking for flatwater paddling, open ocean touring or even fishing.They also have enough curve and sidecut for decent surf performance.That being said ,you’ll be able to enjoy and explore all facets of the sport with only one single board ( a win-win ). The best all-around SUPs range usually between 30-34 ” inches wide as this is the sweet spot that ensures optimum stability when out in the water.You’ll also want to stick to something that is between 10′ and 11′ in length as this gives best maneuverability for a flat water board. Yoga Paddle Boards : If you are a yoga enthusiast and want to take your Yoga practice to the next level and try it on the water, then a Yoga paddle board is your best option.Although you can use an all-around SUP for doing your yoga moves and postures, it’s probably better if you can stick to those designed specifically for yoga as they offer superior stability and support.Yoga Paddle Boards feature a wide platform for various yoga poses and come with a comfortable anti-slip foam grip pad to keep you from slipping and prevent bruises on your knees and legs.We’ve found that inflatable SUPs are also a good choice for Yoga practitioners thanks to their soft surface which makes it much easier to do the poses. Race / Touring SUP : If you’re a seasoned pro and competition racing or paddling as fast as you can from point to point with the wind at your back is your idea of fun, then a dedicated racing paddle board is what you need.These boards are usually longer but narrower when compared to their all-around flatwater paddle boards counterparts making them very fast but possibly too tippy and unstable for a novice paddler. Manufacturers anticipated this problem and they usually have the same model in various widths making the SUP board more suitable for newbies not too fussed about speed versus stability.Generally speaking, this board is not the best choice for a beginner unfamiliar with this sport.However,it would be a great investment for a competition paddleboard rider who wants to increase their speed. 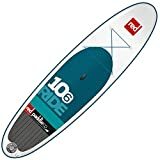 Surfing Paddle Boards : If riding waves is a high priority on your requirement list,then a Surfing stand up Paddle Board is what you should get.These SUP boards are usually shorter and feature a more narrow nose and tail and more curve.They’re also less stable than their longer,wider boards counterparts. Stand up paddle boarding is an increasingly popular water sport. Hawaiians have been using it for years for various purposes.It’s actually one of the best cross-training water sport that delivers a full-body workout.What makes this sport so exciting and enjoyable is that it allows you to enjoy unique views of everything from sea creatures to what’s on the horizon.Not to mention improving your fitness level. Stand Up Paddle Boarding is almost like an art form for true enthusiasts.If you commit yourself to the game and have a strong core from lifting or doing yoga, then you’ll be able to quickly master a SUP. Balance is a crucial part of SUP’ing.one of the most common problems new riders face is that they fight the roll of the water.Trying to keep your body stiff won’t help in this situation and you will slip into the water faster,being relaxed and maintaining your balance however will make your paddling experience much easier. Strong & Healthy Cardiovascular System – which results in decreased incidence of heart attack and stroke.Not to mention weight loss and toned muscles. Increased overall power as a result of improved lower and upper body musculature strength. Improved lower, upper, and your overall core musculature strength. Standing Up on Your SUP : When you’re new to the sport, it’s highly recommended to start out in flat, calm water that’s free of obstacles like boats and buoys.At first, standing on your board might seem like a bit of a challenge, but it is actually easier than you think. Simply stand alongside the board in shallow water, grip the sides and climb onto the board in a kneeling position.Now,keep you hands to either side of your board to stabilize it.And from that kneeling position, get a feel for the balance point of the board and attempt to stand up slowly once you feel stable enough.Don’t worry about slipping into the water at your first time.That’s inevitable and not a big deal. Maintaining balance on Your SUP : In order to maintain your balance while standing upright on the board you’ll need to keep your feet in a parallel position and about hip-width distance apart.Additionally,keep your eyes away of your feet and focus on the horizon or on a distant, stationary object.You should also avoid balancing with your upper-body and focus more on shifting your weight by moving your hips instead.Maintaining balance while paddling boils down to a simple fact,the more forward momentum you gain, the more stable you become – just like bicycling. SUP Stroke : In order to gain speed and momentum, you need to either increase your stroke rate or your distance rate.There is no one technique that fits all and combining both techniques will exhaust you quickly.Getting to know which technique is most suitable for you depends on various factors including your size, weight, fitness level, shoulder flexibility, board and paddle type.However,there is a collection of tips that you can do to increase your speed.First of all, the general rule of thumb is that the very first part of a stroke is the most effective part.Therefore,you’ll need to use you whole upper body instead of just your arms and shoulders.And in the meantime, you’ll need to avoid the “negative angle” which is pulling the paddle out too far back behind your body position where it gets harder to pull it out.Loosing time when bringing the paddle to the front is probably the second most common mistake among novices.We’ve noticed that many beginners tend to bring their paddle to the front in a wide,circular motion,and this means one thing “the longer it takes you to bring the paddle to the front, the more momentum and speed you will loose”. Don’t worry if you can’t get it straight away.It takes time and effort.Remember that consistency and patience is the key here.Finally,at the end of each stroke,briefly relax your muscles, let go of the tension and breathe deeply into your belly.Then, assess your stroke and ask yourself what could you have done to make it better before you throw the paddle in at the front again.